The town of Xunqueira de Espadanedo has nothing of great interest to impress on its own, but it does posses a large monastery with a connected church, both of which hold a prominent position in the lower part of the town. 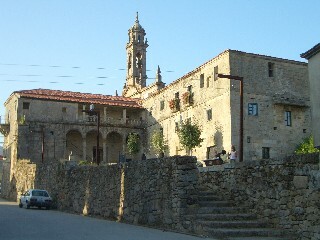 Xunqueira de Espadanedo is situated a short distance off the OU-536 road that leads to Ourense (some 25 km away) and both church and monastery sit imposingly on a ridge that is elevated above the buildings opposite. Above, the monastery in Xunqueira de Espadanedo. 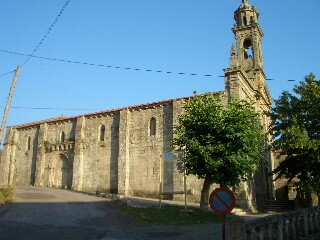 The church is typical of most of the larger Galician churches with stone vaulting, side chapels, cloisters and a large and ornate altar. As ever in Galicia, it was full of flowers and the scent (of what we call funeral lilies) hits you as soon as you enter the building. Externally the church has the typical light granite buttressed walls, a red roof and a narrow steeple. 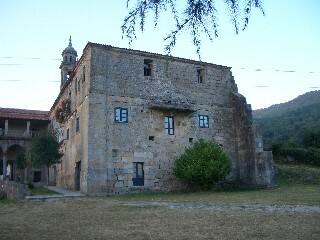 Right, the church in Xunqueira de Espadanedo. The monastery, which is physically connected to the church has a number of nice features with some coats of arms and external cloisters. It is no longer in active use and is now owned by the local council. At the time of our visit, around 9.00pm, it was closed. This is one to visit only if you are on the OU-536 and have an interest in religious architecture. Right, the least interesting elevation of the monastery at Xunqueira de Espadanedo.